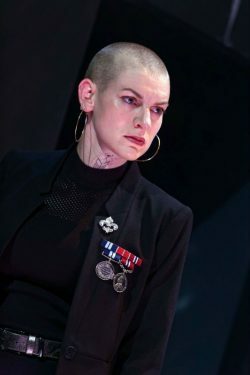 THE universal agreement that Shake­speare’s themes are timeless has been interpreted as carte blanche for modernisations and period swaps, but it’s perhaps never been more effectively done than in the current Shakespeare at the Tobacco Factory production, on stage at the Ustinov Studio in Bath until 21st July. The company, started by Andrew Hilton in Bristol in 1999, has established a reputation for large-cast productions faithful to the text and engaging directly with the audience in the unique surroundings of the former Wills factory in Bedminster. This is a year of change. Andrew Hilton has left the company and for this first “new” production (which will be seen at Bedminster in September instead of the traditional early spring season) executive director Morag Massey has engaged Elizabeth Freestone to direct Henry V.
It opens the summer season at Bath Theatre Royal, and what might have been a risk for season artistic director Jonathan Church and BTR’s Danny Moar is a triumph. For the STF company, this is a small scale cast – 13 actors playing 24 characters in the text cleverly adapted, abridged and re-imagined by Dominic Power and the company. 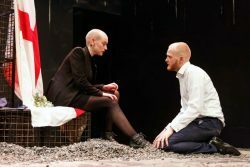 Nothing important is missed, as the chorus (Joanne Howarth) urgently steers the audience through the complexities of young King Henry’s assumption of his destiny. A stark and warlike setting, quick-change “armour” allowing actors to be English one moment and French the next, and a subtly majestic central performance – by turns impetuous, fragile, regal, fearless, energetic and passionate – from Ben Hall (grandson of Sir Peter, who founded the modern Bath summer seasons) bring a rare depth to the excitement of battle. 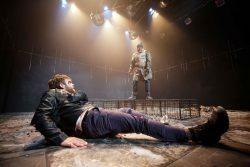 There’s never a moment when this production isn’t offering incisive views of a play most familiar from Laurence Olivier’s patriotic Crispin Crispian speech at Agincourt. The director has made brave choices. She’s known for her campaigns for wo­m­en’s roles in theatre, and here not only do we see a female chorus, herald and lord but French princess Katharine becomes Dauphin of France, heir to the throne. Her warlike attitude, intense relationship with a French duke and evident antipathy to the inevitable alliance with England bring a new dimension to the final scenes of the play, which are often played as an entertaining and charming romance. Katherine is played by Heledd Gwynn, the unforgettable leader in Raucous’s Ice Road in Jacob’s Well Baths in Bristol. STF stalwarts Chris Donnelly and Alan Coveney join recent BOVTS graduates Corey Montague-Sholay, Zachary Powell and Luke Grant in the company. 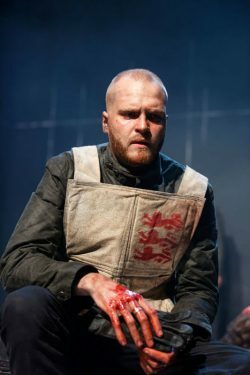 This is a thrilling, thought provoking version of Henry V, and its aptness for the hovering-on-the-verge-of-Brexit Britain is enlightening and never strained. It heralds exciting things for the second phase of STF’s life. 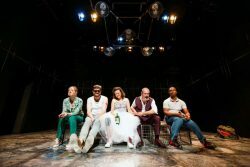 After its run in Bath, the production is at the Tobacco Factory from 12th September to 6th October, and back in the south west at Exeter Northcott from 6th to 10th November, the final date of the 2018 tour. Posted in Reviews on 30 June, 2018 .